Last Saturday we had some people over for dinner, namely Mrs FU's parents and her aunt and uncle, and bloody good it was too. I say that because I did most of the cooking. So yes, of course it was bloody good. A gastronomical triumph of gastronomy even. My starter of crab ravioli with a tarragon vinegar butter sauce went down an absolute treat. I would suggest that it's fast becoming a signature dish of mine actually and in years to come it's bound to become a classic, right up there with Henderson's bone marrow and sourdough, Roux Jnr's soufflé Suissesse and Ramsden’s fish and chips. Mains came in the form of two exquisite racks of handsome Swaledale lamb from the East London Steak Company, cooked medium rare to pink perfection. This was served with a superbly creamy and decadent dauphinoise, potatoes sliced thin and accurate on a mandolin with no hint of fingernails or blood. Greens came in the form of the freshest French beans known to man, shipped from Egypt and plainly steamed to a very precise point, resting right on the fence between raw firmness and pallid flaccidity. All accompanied with a beautiful reduced red wine and balsamic jus (not gravy, jus) with caramelised shallots. A sauce that should have been started by my wife but she was too busy swinging from the chandeliers, swigging from a bottle of Disaronno. I forgave her though. She doesn’t let her down that often and besides, the twins were sleeping over at their other grandparents that night. She did however find a lucid moment to cut up and serve some stupendously magnificent slices of cake to finish us all off. The cake in question was called Grandpa Beard’s upside down ginger cake, the recipe of which was found in an old copy of Olive magazine and baked my Mrs FU’s fair hand. Now the prospect of a heavy, warm, spiced, flour-based pud does sound a bit off kilter as an option to end to such a fine banquet. It’s unseasonal to say the least and I haven’t got a clue as to who Grandpa Beard is but this cake is a cracker. Naturally, it does also help that Mrs FU is a very fine baker *sound of elbow cracking behind back*. 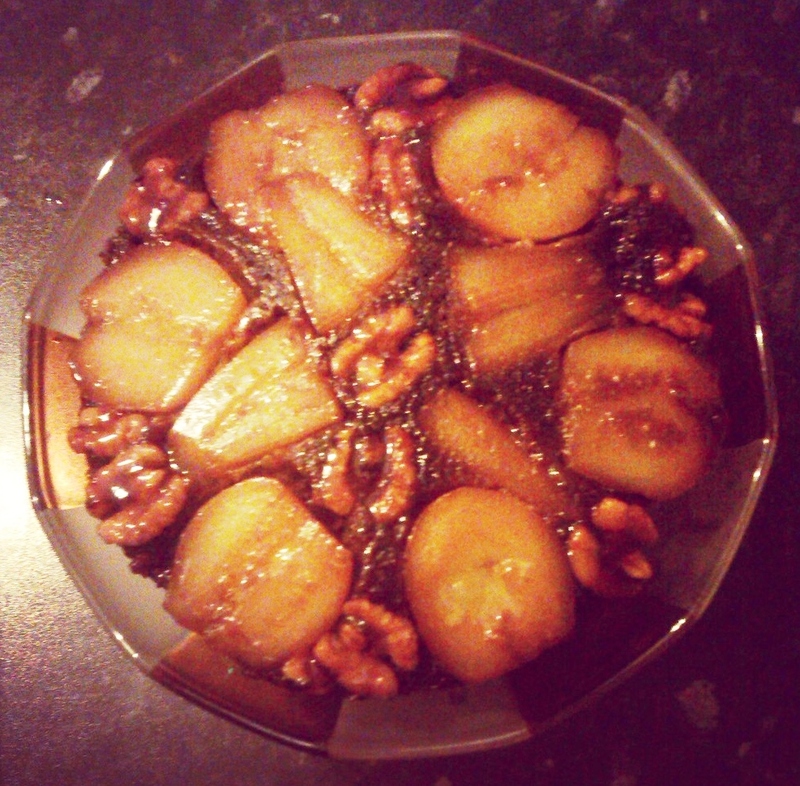 Moreish like McVities Jamaica Ginger Cake yet with the added toffee bonus of juicy pears and crunchy walnut, it is a recipe that I urge you to try. I find that the true test of a dish is how it affects ambient levels of sound during a dinner party. The quieter it becomes, the more successful it is and when we plonked down the plates of cake with clotted cream, in front of our guests, well you could have been heard a pin drop. Which is no mean feat considering the volume levels that my father-in-law and uncle-in-law usual talk at. Both builders by trade, they don’t necessarily talk but more like shout, especially at each other and especially when they’ve had a beer or three. I don’t know why we put them together to be honest but next time we have them over, I might just roll in a cement mixer and stack up some bricks next to the table as an extra touch to make them feel at home. Hell, they might even inadvertently start constructing a long wished for shed at the bottom of the garden for me. Now there's an idea. However, the point is, any dessert that can shut up both these two lovely fellas for more than a minute or two, is the ultimate testimony to its greatness. So like I said, do give it a go. Even if we are in the midst of a happy summer because there is always room in the world for cake. Heat the oven to 180C/fan 160C/gas 4. To make the topping, gently melt the butter in a small saucepan, add the sugar and stir for 1-2 minutes. Smooth over the base of a 20cm cake tin with a removable base, 7cm deep. 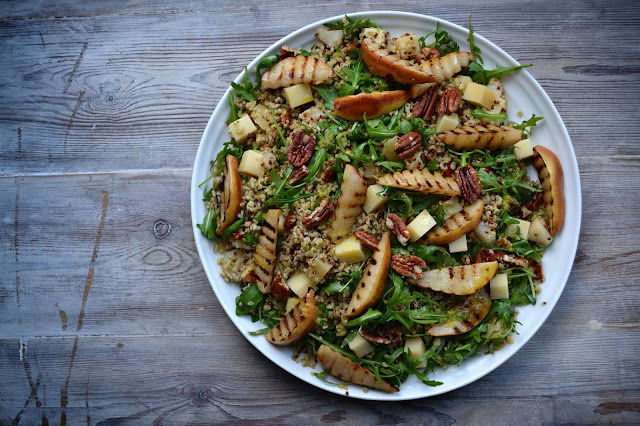 Arrange the pears on top, cut-side down, with a few walnuts around the outside, flat-side down. To make the cake, sift the flour, bicarb and spices into a bowl, and add a quarter teaspoon of fine sea salt. Blend the egg, sugar, treacle, soured milk and butter in a seperate large bowl, and fold in the flour mixture. Beat with a wooden spoon for 1 minute, and the pour the mixture over the fruit in the tin. Put on a baking tray and bake for 40-50 minutes, until a skewer inserted into the centre comes out clean (try to skewer a patch with cake rather than a pear....like, doh!). Remove from the oven, run a knife around the edge and set aside to cool for about 10 minutes. To serve, remove the collar and invert the cake onto a plate or cake stand. Enjoy warm or at room temperature (but avoid chilling), with a dollop of clotted cream on the side if you wish. It was a rather fine pudding done by me and was definatly the best of the all the courses.